This study guide has been produced to modernize, streamline, and simplify the original text whilst continuing to remain USCG compliant as well as now adhering to the new STCW requirements. The long since out-of-print original text, Marine Fire Prevention, Firefighting and Fire Safety, was published over forty years ago by the Department of Transportation, Maritime Administration. Although the basic principles in marine firefighting have not changed, this study guide offers up-to-date information for a better understanding of the principles and the methodologies involved. 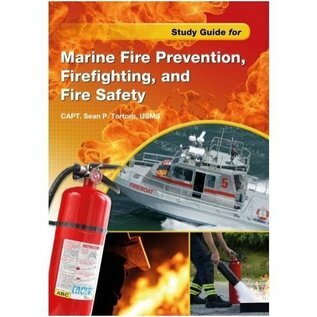 In addition, this study guide includes all the contents required for a U.S. Coast Guard-approved marine firefighting course, as well as meets all the competencies for the International Convention for the Standards of Training, Certification, and Watchkeeping (STCW), per the latest 2010 Manilla amendments. Moreover, this study utilizes current-day examples, equipment, and techniques, breaking down the text into twelve easy-to-follow lessons: basic shipboard firefighting organization and safety, causes of fires and methods of prevention, theories of fire, combating fire, extinguishing agents, extinguishing appliances, fire detection systems, fixed fire extinguishing systems, safety and firefighting equipment, and respirators and the self-contained breathing apparatus. These lessons will provide the students the knowledge to not only successfully fight shipboard fires, but prevent such fires and in doing so, keep his/her ship and all that ply the seas onboard safe.